Horslyx contains a high specification package of vitamins, minerals and trace elements to balance the deficiencies in the diet. The palatable, weatherproof and cost effective lick provides a natural, trickle feed pattern which reduces the chances of sugar peaks. This little and often system means the nutrients are absorbed in the small intestine and don’t upset the balance of micro flora in the hind gut – which significantly reduces the risk of laminitis. Monitor your horse or pony’s grass intake – this could be through shorter periods of grazing, turn out on poorer quality pasture, using a muzzle or strip grazing. 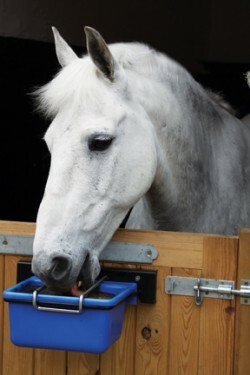 Try and reduce the cereal content of your horse’s feed as this will lower the starch intakes. Many laminitic horses require a low calorie high fibre diet, however some will have a higher energy requirement. If this is the case choose products such as oil, alfalfa and sugar beet, as they contain little starch and provide slow release energy. When your horse’s body is under stress, whilst you obviously do not want to add calories, they still need support to aid their recovery. Ensuring they receive the necessary vitamins, minerals and trace elements, along with anti-oxidants will help give them the building blocks for peak health. Ensure a farrier attends to their feet on a regular basis and supplement their diet with ingredients to help promote healthy hooves, including biotin, methionine and zinc. Monitoring the intake for horses suffering from laminitis is the key to safety when feeding Horslyx. Do not allow free-access as a hungry horse is more likely to over-consume. A simple way of restricting intake is by using the 5kg Horslyx Holder with restrictor bars.